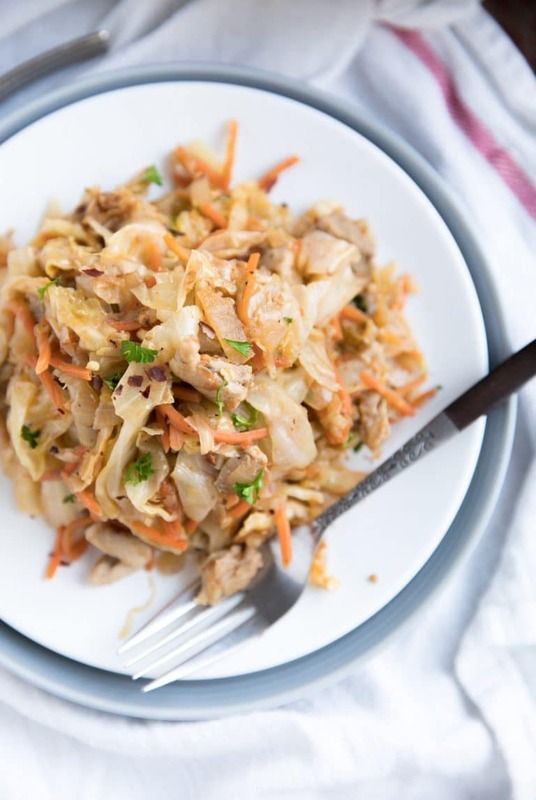 Protein rich chicken and savory cabbage come together in this easy, delicious and super healthy low-carb Chicken and Cabbage Skillet. Whenever this particular day of the year rolls around it always brings back memories of college. Especially my first two years, before I got serious with studies or a boyfriend (my now husband). I was very active in Alpha Psi, the local sorority at UC Santa Cruz and was always up for an excuse to go out and party. St. Paddy’s Day was always a favorite. One of my sorority sisters, and one of my very best friends throughout my college years was particularly fond of this holiday. She was always my favorite person to do just about anything with, but thanks to her overwhelming excitement for this one day of the year, she somehow made St. Patrick’s Day one of my favorite days, too. Jäger bombs… ohhh, how I do not miss you. But, I am so thankful for the memories we shared together. Why am I sharing this? I can’t say for sure, but it probably has something to do with the old best friend of mine and the St. Paddy’s Day memories I have thanks to her. You know the memories I’m talking about- the ones that feel so recent, it’s almost like you can touch them (no matter how many years have come between). Now that I’m old, St. Patrick’s Day is a whole lot different than it used to be. Now, this holiday is focused on dressing my child in green, which I failed at today, by the way. Apparently, the closest green colored clothing item he owns is teal. Next year i’ll be prepared since every single kid in his class was dressed head-to-toe in green. How do these parents have the time to go out and coordinate these perfectly matched outfits? Do they take their kids? I took Octavian to Carter’s today because he needed summer pjs and he practically destroyed the sunglasses display (which they’re asking for if you ask me) and started doing wind sprints around the store as I checked out. When I got to the checkout, the lady said to me, “Oh wow! He seems so much older than the last time you guys were in here. I remember the last time he was quite the handful”. Yep, he’s actually doing really well today, I say. Little does she know he and I had a big talk about behavior before going in to the store. Meanwhile, I’m the mom who has literally never dropped off, or picked up, her child in anything other than yoga or running clothes and wears my hair in the same braid I slept in (and probably worked out in). No judging anyone here, though. At least I actually work out. Plus, if you saw Octavian’s clothes after a couple hours on his body, you would probably understand why I rarely buy special outfits. Ok, whoa. That went way off topic. Sorry, guys. Sometimes I just start typing as if I were talking. All of that up there was just me trying to make myself feel better. Anyway, aside from dressing my child, St. Paddy’s Day also means FOOD. I can’t say if any of it is traditional (corned beef and cabbage? ), but I do know it’s GOOD. I am also learning that there are about a million and one ways to use leftover corned beef and cabbage (CORNED BEEF, POTATO, AND EGG HASH | REUBEN TWICE BAKED POTATOES | CLASSIC REUBEN SANDWICH | IRISH CORNED BEEF POTATO PANCAKES). And that’s nothing! The ideas I have running through my brain for next year? I can hardly wait! 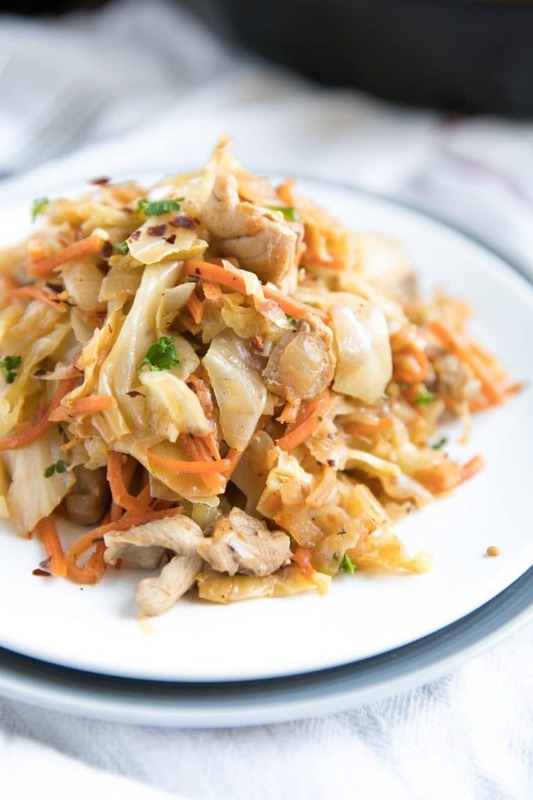 Now, if you’re not a huge fan of corned beef, but love cabbage (cabbage is so good, you guys! 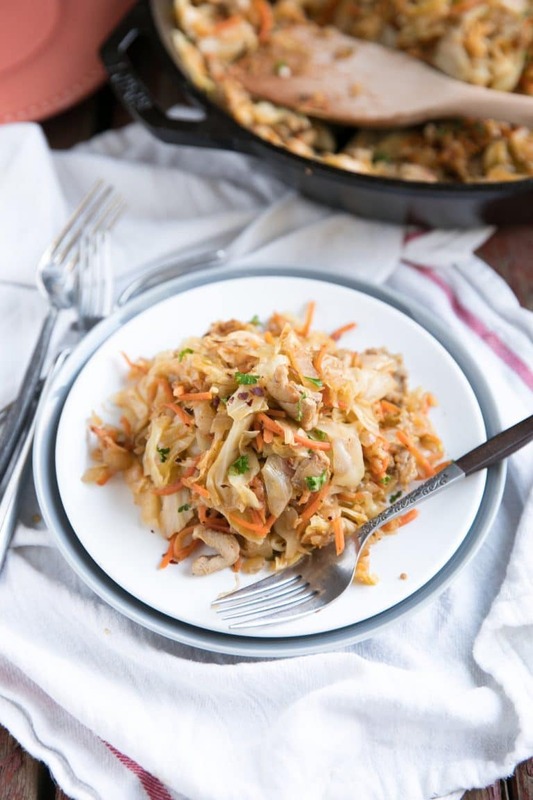 ), then maybe you’ll like this easy Sautéed Chicken and Cabbage Skillet. It’s a definite keeper if you’re looking for something a little lighter or you don’t eat beef. I love this dish because it’s so easy and jam packed full of vegetables. 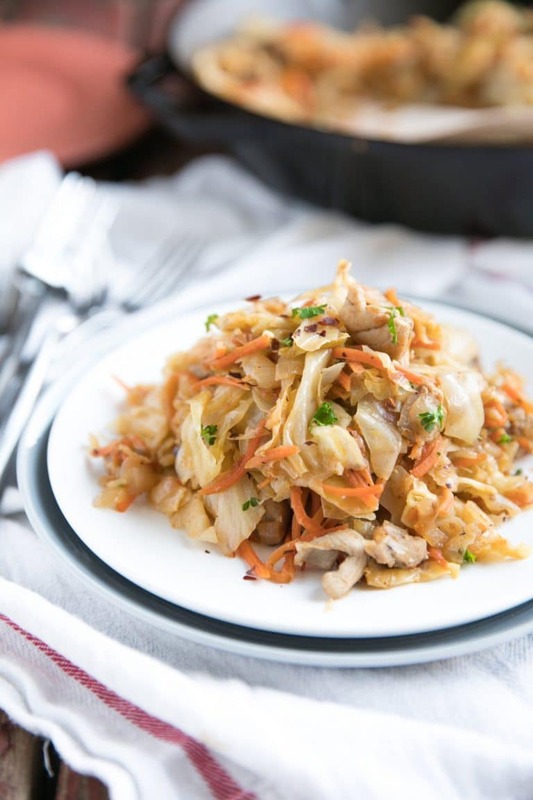 In fact, this chicken and cabbage skillet is all vegetables except for the chicken. It is satisfying enough to eat alone, or as a side of a larger meal. Missing the carbs? Add some noodles and a sprinkle of cheese or keep it super simple and eat it with some fresh buttered bread. 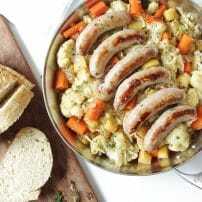 Heat a large skillet or Dutch oven over medium high heat. Add olive oil to the pan and gently swirl to coat. When pan is hot add the chicken pieces and sprinkle with salt and pepper. 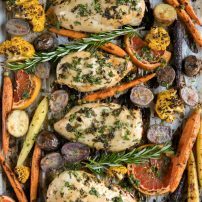 Continue to cook for 6-8 minutes, or until chicken is fully cooked and lightly browned. Carefully transfer chicken to a clean plate using a large slotted spoon. 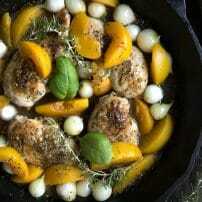 Using the same skillet or Dutch oven, place the pan over medium high heat. Add 1 more tablespoon of olive oil to the skillet and the large diced yellow onion. Stir to coat the onion in oil and scrape off any brown bits that may be stuck to the bottom of your skillet. Sautè the onion for 3-4 minutes, stirring frequently, or until onions just start to soften. Add the minced garlic and paprika to the onions and sautè for one more minute. 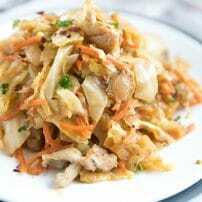 Mix in the shredded carrots, chopped tomatoes, chicken stock and chopped cabbage. Reduce heat to medium low and cover with a fitted lid. Cook for 15 minutes, stirring occasionally. 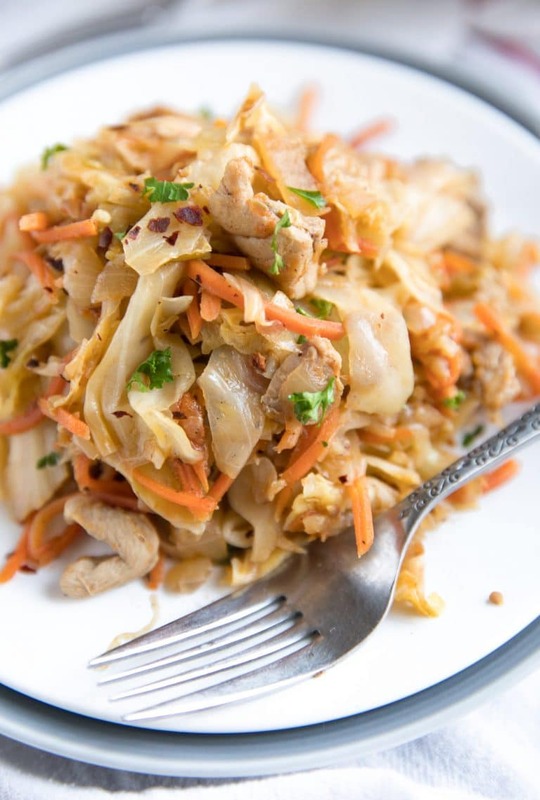 After 15 minutes, remove cover and return chicken to the pan and mix with the vegetables. Season with salt and pepper. Continue to cook on low for an additional 15-20 minutes, or until there is no liquid remaining. Garnish with fresh chopped parsley and red pepper flakes (if desired). 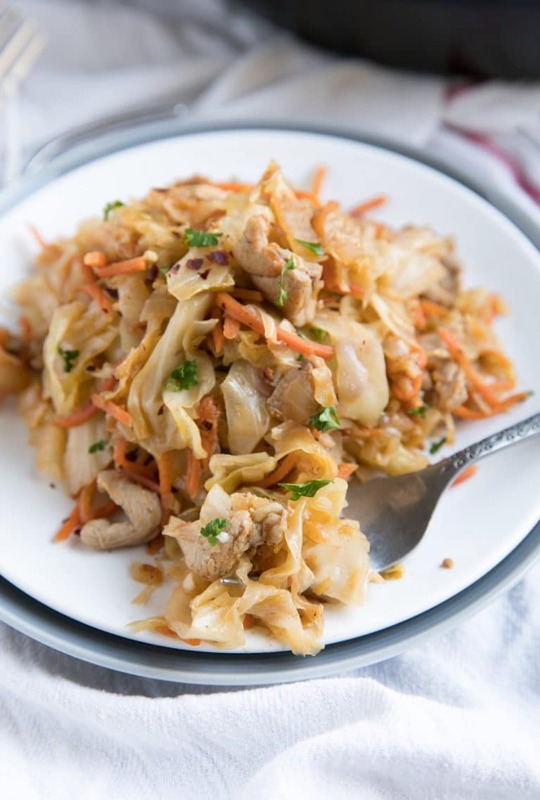 Can you freeze leftovers? It was delicious. I have not tried to freeze this recipe, so I honestly cannot say. I am not sure if the Cabbage will freeze well; however, if you try to freeze it please do report back after you try it – now I am curious!